It has slowly dawned one me that none of my friends from London are going to come and visit me here in Sydney. 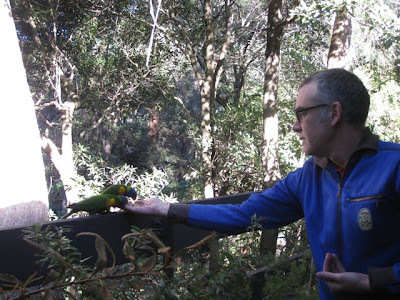 I used to think that they would make the superhuman effort to come on over but "It's too far", they whine; "The children make it too expensive", they moan; "I don't like Australia", they opine; "What about the insects?" they fret. So I am having to make new friends and the quickest way to do this is to anthropomorphise all the creatures around our house, now know as Glenview Zoo. I'd like to introduce you to Thang and Kev, our newest best friends. 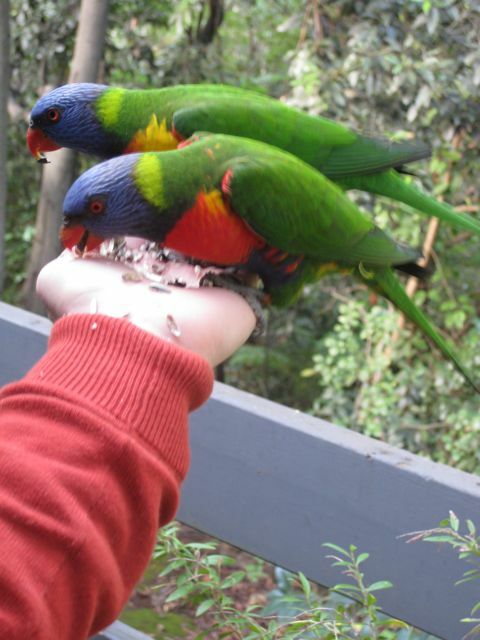 Thang and Kev are two rainbow lorikeets. 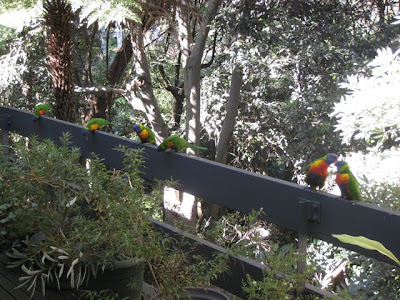 They have taken to coming every day to our balcony to be fed sunflower seeds by hand. Kevin's in the foreground. He has a much redder breast than Thang but is a cautious bird and took some persuading to graduate from the balcony railing to my hand. Thang on the other hand leapt straight on to my palm and bit my thumb. Saucy minx. It began only a few days ago. Thang and Kev first appeared (they always appear together) one morning whilst I was sat on the balcony in one of our new directors chairs reading a paper. They perched at a far distance and chirupped and bobbed their heads up and down, their beady red eyes searching for something tasty to eat. I rushed inside and got the wild bird seed box and laid some seeds out in a line along the railing. 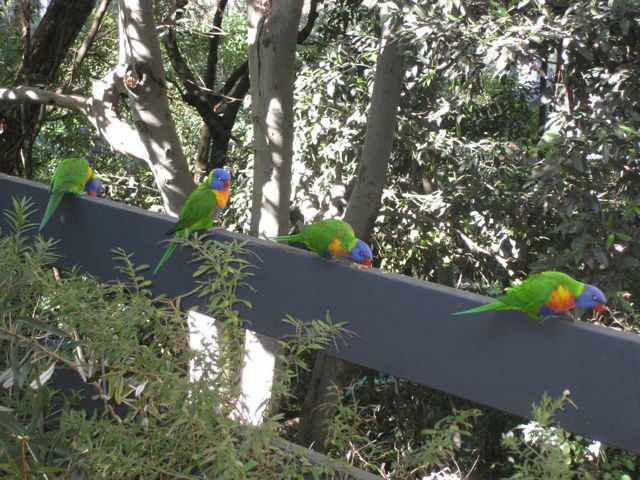 They slowly crept up to them and began pecking avidly away. After a while they agreed between themselves that pecking directly from my hand whilst it rested on the railing would be OK. Soon after that I tried holding my arm straight out in front of me with my palm full of seeds. 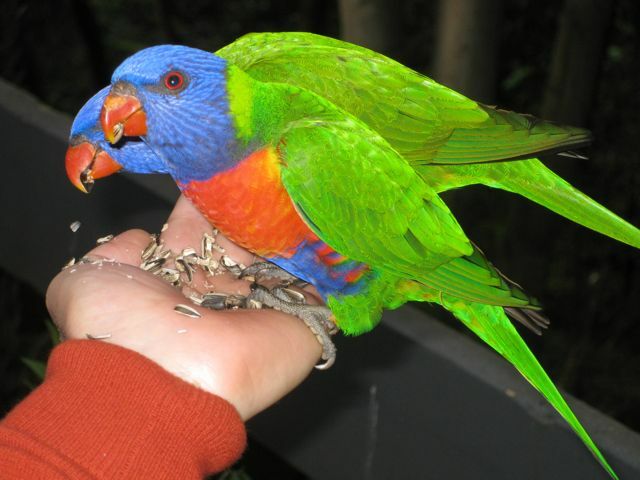 Thang flew straight onto my outstretched hand and started cracking open the husks. Kevin kept making feints for my arm but fluttered off in confusion four or five times. Eventually he made a crash landing and they settled, side by side, on my hand. And now, three days later, I am having to shake Thang and Kev vigorously to get them to release their tenacious grip on me. 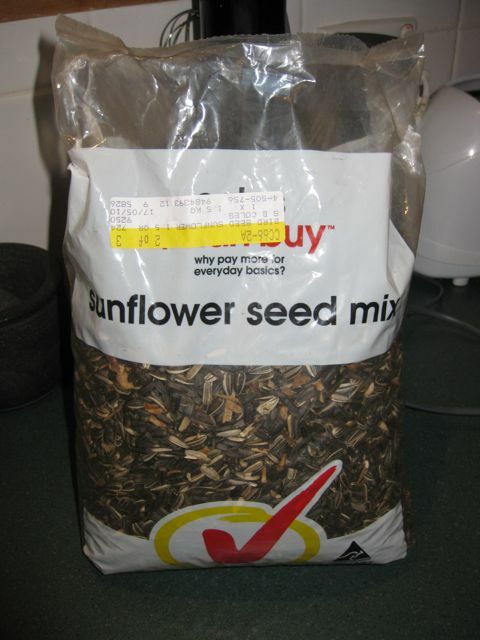 I soon learnt that only sunflower seeds would do for Thang and Kev. All the other seeds in my wild bird variety box were quickly discarded as beneath them and chucked nonchalantly into the bush (which means that I am going to have to crawl under the balcony and make sure things aren't sprouting which shouldn't be sprouting or else the Bush Regeneration people are going to get me). So it was off to Coles yesterday to buy a bumper packet of cut-price seeds. Why, indeed, pay more for what is obviously now an everyday basic? Thang and Kev aren't picky. Oh no. Anyone will do if they've got food in their hand. Below you can just see that Thang has a yellower breast which for some reason makes me assume she is a she. They both have a rapacity which is quite frightening and sometimes, beneath their gaudy exterior, you can glimpse a rat-like quality which is rather alarming and makes me worry a little about getting psitticosis. Shall keep you posted. ha ha ha ha ha ha ha ha (that's the sound of me rolling around the room at the sight of the increasing numbers of Thang'n'Kev clones on your fence...xxxx I love being a bird. Why is Australia so far away? Take care, they look ominous - as if they are mustering to eat their way through your timber walls and take Sniff away from his spot by the fire. Keep warm, it's so hot here in England today.